The people at the Council on Foreign Relations speculate that US interest rates on Treasury debt will be increasing around the end of the first quarter if the Fed discountinues its monetization of mortgage debt. As the Fed has essentially purchased ALL new US Treasury issuance since 2009, that seems to be a reasonable bet. “The Federal Reserve plans to stop buying securities issued by government housing loan agencies Fannie Mae and Freddie Mac by the end of the first quarter. This is not only likely to push up mortgage rates; Treasury rates should rise as well. 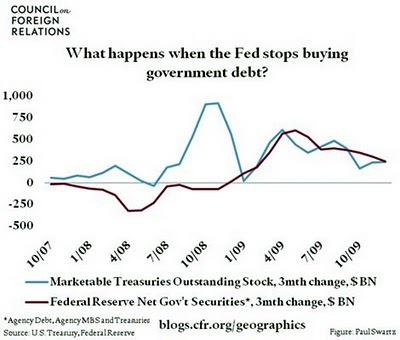 Throughout 2009, the private sector sold a portion of their agency holdings to the Fed and used those funds to buy Treasurys. Once the Fed’s agency purchases stop, this private sector portfolio shift will end, removing a major source of demand in the Treasury market.